I’ve worked in publishing since 1999, and I’ve been serving, supporting, and coaching writers through Nomad Editorial since 2005. I’m thrilled and honored to have so many satisfied clients who keep coming back and who generously recommend me to others! I’m terrible at editing my own work—in fact, I believe everyone is because we are too close to our own words. So even though I had three beta readers for my book, I knew I needed to have a professional edit the book line by line to capture any small errors (or even big ones). Amy did just that! She found all the little mistakes, and she commented on some developmental issues that neither I nor my beta readers had caught. I believe my book is 100% better because of Amy’s keen insight and skills. If you’re on the fence about whether you need a copy editor for your book, trust me: you do! Your readers and I would bet your book sales will thank you for it. Amy was able to take my mashed-up thoughts and help me turn them into a cohesive final product. She pointed out the holes in my writing and offered prompts and questions to help fill them in, and she also handled the fine tuning (grammar, spelling, and consistency). I felt like I had a secret weapon in my work with Amy—she was amazing. I highly recommend her! Working with Amy allowed me to just write, knowing she would have my back as far as editing was concerned. I was very happy with her professionalism and work ethic. She delivered when she said she would and was very easy to work with. As a consultant, I expect the highest quality, and Amy exceeded my expectations. Both her initial feedback and final line edit helped make the book clear and concise. Amy was easy to work with and her editing and suggestions took my writing to the next level of excellence. The best decision I made in writing my book was hiring Amy to edit it! Amy’s depth of thinking into my subject matter really amazed me—she’s not a farmer, yet she embraced the subject, understood what I was saying, and seemed comfortable with the unique terminology I was using. Amy did a wonderful job, and my book came out so much better than I expected. I now tell everyone who is writing a book to budget for an editor and call Amy! I wasn’t sure hiring an editor would be worth it, but Amy’s excellent feedback greatly improved my manuscript so I felt more confident giving it to a beta reader to evaluate. She’s really good at what she does, and I was delighted that she was very flexible to work with and accommodated my needs. Amy transformed my book from good to great. Her attention to both detail and the big picture meant that my ideas were more clearly communicated and my message was stronger than ever before. Her process was easy to manage and thorough. I wholeheartedly recommend her for your next writing project! Without Amy, my book probably would have never seen the light of day. To start, I sent her a very bare-bones manuscript; I didn’t want to write the whole thing only to hear that it needed to be changed completely. Thanks to Amy’s amazingly helpful feedback, I had a great structure to build upon and knew exactly which direction I needed to take. Later, her copyediting helped polish and fine-tune the text. Amy blew me away with her insights, and I know I will turn to her again in the future. Hiring an editor helped me clarify my thoughts and take the steps to actually publish my book. Amy’s approach when raising questions and giving suggestions was respectful yet direct, and helped me open up to totally changing the order, deleting parts of the book, and adding more text to clarify. Having a professional read my book first made it easier to then give it to a friend to read, and I now feel more confident about sharing it with a wider audience. Amy offered great perspective and feedback on my writing, and I was impressed with how quick and thorough she is. The content we worked on together is clean, tight, and ready for readers, and I feel confident that they will understand what I’m trying to teach. I love working with people who are able to key off of the present vibration, adjust, flow, and provide synergy. That’s what it was like with Amy. She was always kind and positive, and her calming energy eased my stress. A talented and professional editor, Amy asked good questions about key concepts, revealing why/when they didn’t make sense. She allowed me to maintain control of the book but stepped in when I needed direction. I was also grateful for her tech support on things like using tracked changes and merging documents. Amy is more than an editor. She is a one-woman support team to help you finish and publish your book. Warning: there’s a lot of work to writing a real book! Amy is so thorough in her approach that after receiving her feedback, I had extensive research and rewriting to do to make my points stronger. There was more work for me, but her help was invaluable. During the developmental editing stage, she reorganized the outline of the book and significantly strengthened the material. During the copy editing stage, she did all the heavy lifting to clean up and finalize the content. It was really a pleasure working with someone of Amy’s caliber and timeliness! If you want your writing to become a work of art and something you’re proud to be the author of, you really need Amy. Working with Amy, I felt like I was no longer on my own and that I was truly being supported by someone who is not just a great editor, but someone who cares about the success of my project. She asked all the right questions to focus my thoughts, make my message clearer, and dramatically improve the flow of my book. She was able to take a manuscript that I was beginning to get frustrated with and turn it into a book that I am proud of and excited to publish. Amy came highly recommended as someone who could help eliminate redundancies and clarify the overall message of my book. Amy’s work was excellent, and she helped make my book more focused, streamlined, powerful, and easy to read. Not only that, but we were working with a tight timeline, and I was impressed with how quickly she was able to turn this around. I was nervous about the process, but Amy made it fun, and I’d absolutely recommend her work to others. Amy has a special combination of insight and kindness in her editing. I’ve read that a great editor brings out the best in you and your work, and Amy did just that for me. She helped nail down the clarity and flow of the piece and gave new life to text that had fallen flat, making the words practically dance across the page. I had no idea I would love the entire process so much and it was an amazing feeling knowing my story was in such good hands. After the editing process, my manuscript was better than I ever imagined it would be. I knew it was in perfect shape to submit for publishing, and that confidence was priceless. Without a doubt, I would recommend Amy to anyone looking for a skilled and truly gifted editor! Amy’s patience and unflinching approach to editing my manuscript made it what it is today. Amy asked all the right questions to guide me in developing my memoir into a story that could easily translate to a broad audience. I realize some authors are afraid an editor will alter their voice or style, and she absolutely did not. 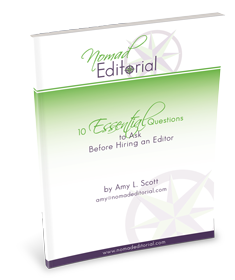 The cost of hiring an editor isn’t pocket change, but Amy’s guidance was irreplaceable and worth every penny. I will hire her again in a heartbeat. There were many things I loved about working with Amy. First of all, she is incredibly reliable—and when you have a pipeline where one part of a project depends on the timely completion of another, meeting deadlines is imperative. Secondly, Amy went above and beyond to make my piece captivating and easy to follow. She also improved the flow tremendously, which was incredibly important to me. The information needed to be presented in such a way that readers would fall in love with the program I was introducing them to, and Amy nailed it! I’d never worked with an editor before, and I honestly did not expect an editor to let me be in control of my work, but Amy always made sure I got what I wanted (only in an edited fashion). I was also very impressed by her ability to communicate with me in layman’s terms. I was relieved that Amy was so easy to work with. She’s very good at what she does and I had the most pleasant experience working with her. I wasn’t sure I could afford an editor or if I even needed one. However, I wanted my book to be fantastic, so I thought I would see what was out there. When I saw Amy’s work on an excerpt from my book, I was sold. Not only did she correct the minor punctuation errors, she gently pushed me to write more and expand ideas that really helped my book take shape. I just got my first copy of my print book today! Thanks so much, Amy. I couldn’t have done it without you. I was surprised (in a good way) by the time and effort that Amy put into her work. She paid close attention to my content and if something wasn’t very clear, she offered suggestions that were smart, clear, and action oriented so it was easy for me to go through her edits and decide what to do next. I feel confident that my proposal is more powerful now than it was before I hired Amy. Amy is smart and a total professional; she gets the work delivered when she says she will, and gives more than you expected so that your materials are polished and cohesive. I hired Amy to edit my first book in English. My English is good, but it is my second language, and I wanted to make sure it was perfect. I have worked with quite a few editors before, but none with an eye for detail like Amy. When I got my manuscript back from Amy, it was filled with corrections and suggestions for changes. It was amazing! Every single suggestion made my text better and my readers will benefit from Amy’s hard work. I cannot recommend Amy highly enough. Not only is she a knowledgeable and perfectionist editor (and you really want that), she is a joy to work with. If you don’t have an editor yet, hire Amy. You won’t regret it. I hired Amy when I was writing a city travel guide, which was to be my first self-published ebook, and I knew I’d need an editor to review it for grammar, punctuation, and spelling errors. Amy kept in touch regarding her work on the ebook, delivered the edits on time, and went above and beyond my expectations. The finished ebook will have far fewer technical errors (if any) as a result of Amy’s edits. Seeing how many mistakes I was unaware of was an eye-opening experience. I would absolutely recommend Amy to other writers. Amy made a huge difference in my ability to get my book done, and to turn out a manuscript that I had every confidence was free from typos and incorrect wording. More than that, it felt like Amy was a partner in the process. I couldn’t wait to get her comments back, and she was very responsive to my needs. She made the process fun, and the quality of the final product is far superior to what it would have been without her help. I would definitely hire Amy again, and recommend her services to anyone who is looking for editing. Amy has a unique talent for polishing your words while keeping your voice. With her help, my book still sounded like me, but better and free from errors. Amy’s advice and recommendations were always very generous, easy to follow, and uplifting. She was essential in helping me finish my book. I enjoyed working with Amy, and recommend her to everyone who has a message to share with the world. You’ll be in safe hands! I’m blessed to know Amy Scott. As a non-native English speaker, I have always felt insecure about putting my writing out to the world, but working with Amy has helped me build my confidence. Within only a few months I was able to write a book that I had always wanted to write! Amy holds a very strong presence and intention that goes beyond her incredible talent as an editor. She has this rare ability to ask questions that I didn’t even know I should ask myself in order to move forward with my writing. I feel truly seen and supported by her and she shows up and inspires me to keep going when I get stuck. I recommend Amy with all my heart to anyone who wants to write a book of their dreams and feel held throughout the entire process. My coauthor and I turned to Amy because our book lacked organization and our message wasn’t clearly defined. We had a lot of content, but it didn’t flow well and needed a creative touch. When I first spoke with Amy, I was overwhelmed and hoping she would take the lead and help us complete this long-overdue project. And she did. Amy made this process so much easier. She took a lot of my stress away because I was always questioning my writing ability. Turning it over to Amy and trusting her was so helpful. Our book is finally done, and it’s because of Amy’s great knowledge and expertise. She was wonderful to work with. Amy provided high-quality recommendations and edits to make the content easy to read and understand, and to make it resonate with my target market. Other editors have put their own spin on my content without understanding the objective. But because Amy has a similar target audience and works with many women whom I consider to be my peers, she was able to give me a tailored experience that was completely aligned with my objective, my offerings, and my ideal customer. I would absolutely recommend Amy without hesitation! I sent Amy some copy I had written for my website. I thought it was pretty good, but figured she might find a typo or two that I missed. Was I ever wrong! She came back to me with a ton of fantastic changes and comments. I’m hooked! Amy is amazing. I came to Amy because I needed someone to look at my writing with fresh eyes, to find mechanical errors and suggest other improvements. She greatly improved the clarity of the text, and her edits caught lots of little errors and made the text simpler and easier to understand. Amy approached my writing with kindness and respect, and working with her was easy and fun. I absolutely recommend her to others. I had a story to tell, and seemingly plenty of words, but wasn’t sure if the way the words were structured would be easy to read and follow. Once Amy had edited my manuscript and highlighted areas for clarification or further expansion, it really did feel like it was still my voice, but better. The emotion and poignancy were still there, but where my thoughts had flown from my head to the paper in a constant stream, they were now subtly structured and organised for ease of reading by someone who hadn’t lived my life and couldn’t fill in the gaps themselves. Thanks to Amy’s input, when I sent my manuscript to a publisher I was much more confident in the response I would get even as a first-time author. All our work paid off, and my book was published by Action Deafness Books! After many drafts, I couldn’t see straight. I knew I needed professional help to improve my manuscript, and I got lucky in finding Amy Scott. From the beginning, working with Amy felt like a collaboration. It felt as though she was just as invested in my book as I was, which was a true gift. Amy asked the perfect questions, in just the right way, to help me clarify what I was really trying to say. The text flowed so much better after Amy rewrote parts of it and moved sentences and even whole paragraphs. I learned so much during our process, and my writing has greatly improved as a result. Amy has experience in traditional publishing but also embraces the digital world with curiosity and enthusiasm. She helped me solve problems as I navigated the many complicated issues around editing and preparing a manuscript for both print and e-book formats. I highly recommend Amy, and she will be my first choice to edit my work in the future. She is simply a delight to work with, and hiring Amy was the best decision I made for my self-published book. I worked with Amy for about six months on editing my training manuals, website pages, and free offering (no small task at somewhere around 300,000 words). Before I met Amy, I had been sending sample pieces out to prospective editors, but it was a horrible experience. With Amy, things were very different. During the back-and-forth editing process, she was professional and highly organized. She asked insightful questions, and her natural curiosity was a driving force in creating greater clarity in my text. I’m not a professional writer; my expertise is in building collaborative teams. While I needed my writing to be clear, I also wanted to preserve my unique style, and Amy was able to strike that perfect balance. I plan to work with Amy again and I highly recommend her for any editing job. She is at the top of her game.